WDG Named Top Developers and Top Creative and Design Agency in Washington, D.C.
WDG is excited to announce that we have been chosen for various awards given to top performing web development companies in DC. 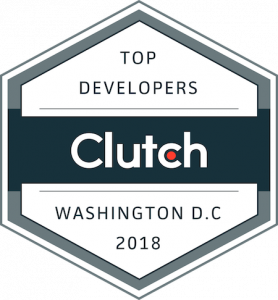 These awards are given by Clutch, a trusted data-driven research firm in the DC area. Being ranked by Clutch is meaningful to us because they are a trusted source of company comparisons and expertise. They interview clients, collect data, and compare competitors in order to gather accurate and valuable information on companies. We are also pleased to have been recognized as a top ten agency for Web Design, Digital Design, and UX categories. Are you interested in working for an award winning web development company? Contact us today!